My birthday is on the 6th September and I have 1 brother. My favourite game is playing badminton. In Patna life is hard for children like me. But sponsor me today and you can change my world for good. Bhavna lives in Patna, India. By sponsoring her, you can help her whole community, to make it a better place for children. 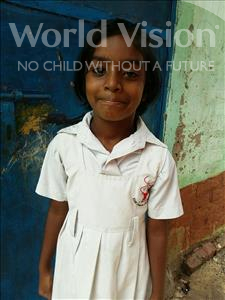 For children like Bhavna, growing up in Patna, malnutrition, disease and illiteracy are facts of life. With no proper protection in place, children don’t always feel safe and are often scared of abuse. Many children work to help their families survive, and drop out of school. Schools are overcrowded and teachers are poorly trained. Parents can't afford to buy clothing and school books for their children. Children often have to miss school and work to support their family. Your sponsorship can change Bhavna's world, and her community, for good. Your sponsorship will provide tools and seeds to help families feed their children. You'll help train parents with the skills to earn a decent living. You'll help parents with small business loans, so their children are free to learn.